There are only 17 days until the September 1 deadline for The High Chaparral Reunion registration deadline! The deadline for registering for The High Chaparral reunion is September 1, after that date there will be late fees added to the registration price. 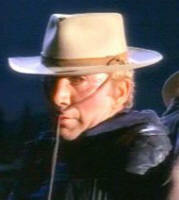 Go to www.thehighchaparralreunion.com and save $75 in late fees today. There is no guarantee we'll be able to fit in late registrants, plus you'll save $75 per person on every one who signs up. Fan Brenda Greenwood shared her memories after the 2009 Reunion. You could be sitting with Henry Darrow's arm around you with that famous double-dimple smile aimed right at you! 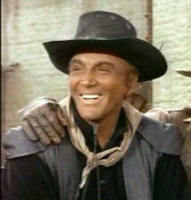 And after spending a weekend with the High Chaparral bunch, they'll all be proud you call them friends! My thoughts on the reunion was that it was more than I had ever imagined! We didn't get to Tucson until Friday afternoon, and we sat at a table chatting with a few new friends we had just made. Henry walked into the room first and someone told him I had come from the UK, and he just came up to me and gave me a hug and said how pleased he was to see me - it was as if I was the celebrity! He signed my photo which was in my goody bag, without me asking him, and he made me feel like the queen. He was so natural. It was good to see all the stars and production team getting on so well and pleased to see each other after such a long time - and their informal chat was so informative. At the end of that session Rudy was lingering and we asked for a photo - and he made the person taking our picture do it so many times until the right shot was taken with all looking good and smiling. I can't think of any other celebrity that would give so much time and attention to detail - he was wonderful. 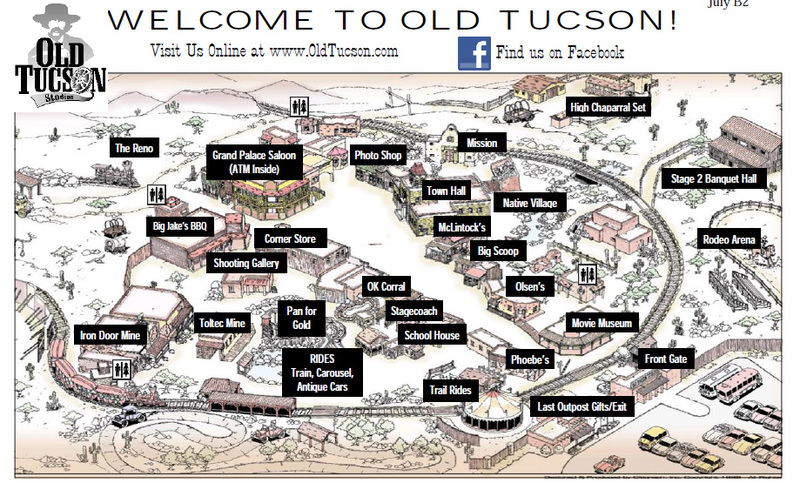 Saturdays trip to Old Tucson Studios was just fantastic, to give us an idea of the place where it was all filmed - you could almost imagine it happening right there. What a magical time it was helping Don celebrate his 81st birthday with his family. Very few people can say they had that privilege!! And I loved the way the bag and bandana were arranged on the tables - wow, what thoughtfulness went into it. Sunday brought the lovely autograph and photo session, as though these guys hadn't already given us so much time, and I was very fortunate to get some time with Ted before he had to leave. This is the most memorable holiday I have ever had! The memory's are etched on my mind, and I'm still living the dream that I had as a young teenager. Well done to all who had a part in arranging this reunion, and to Penny for all the hard work she put in, and especially to the guys who came and treated us like celebrities. I shall definitely return to the next one. 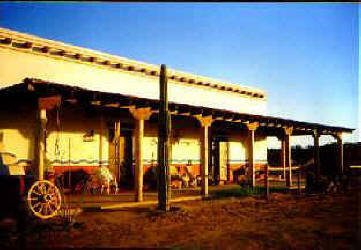 In Yuma sits a perfect replica of The High Chaparral ranch house, built by Ronnie and Sue Rubino. Many Chaparral fans have visited and can attest to what an uncanny job the Rubinos have done duplicating the Cannon ranch home. After getting approval from David Dortort himself, Ronnie embarked on an adventure building his Chaparral home you can read about on The High Chaparral website. Visitors are welcome with advance notice. You can meet Ronnie at the Reunion this year, so ask him about his beautiful home then. 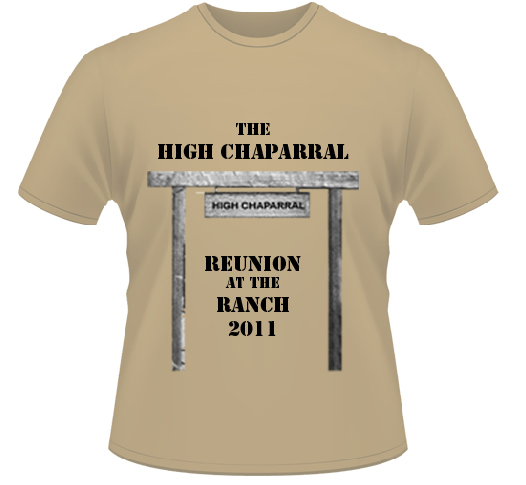 Can't make The High Chaparral Reunion, October 21- 23, 2011? Don't miss out on some of the great one-of-a-kind merchandise that will be available only to the fans who attend....until now. Bid now in this ebay auction and be one of the select few that will have this set of High Chaparral themed items for their very own. Auction ends August 27th so visit the site soon. 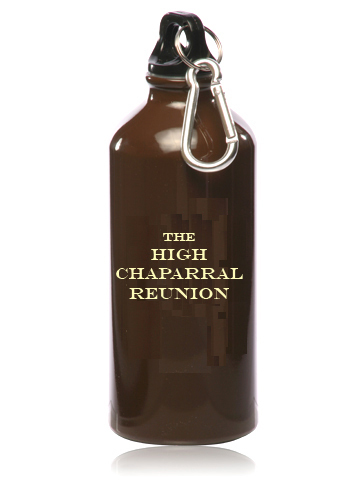 The winner of this auction will get a High Chaparral Reunion at the Ranch 2011 T-Shirt, in your choice of size (S - XL), a High Chaparral Reunion Water Bottle, paba-free, in a shiny chocolate brown color (perfect for a trek through the Arizona desert) and a 8 1/2 x 11 color photo of the entire cast of The High Chaparral. This photo will be signed for you by High Chaparral cast members and honored Reunion guests Don Collier, Henry Darrow, Ted Markland and Rudy Ramos. They'd be glad to sign your T-Shirt as well if you'd like (though all the reunion guests are subject to change for health, personal or business reasons so all signatures are not guaranteed). 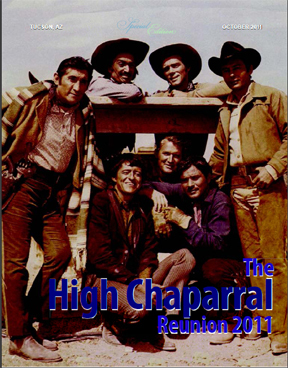 Please be aware that your High Chaparral goodies will not be available until AFTER The High Chaparral Reunion. They will be mailed to you during the week of October 24th, 2011. Shipping is free! 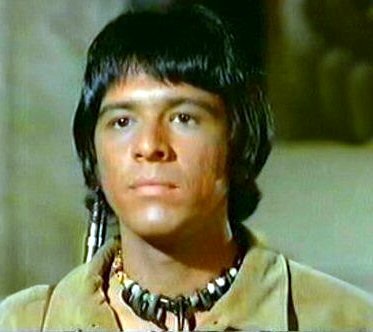 Though Ramos has no previous professional acting credits, David Dortort, executive producer of The High Chaparral, says of him, “Rudy has an uncanny, natural, acting ability which, combined with his rugged, athletic appearance, makes him perfect to portray our new character. We have high hopes for him." 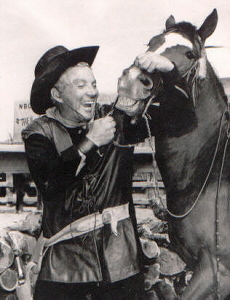 Fans often send email asking for a copy of The High Chaparral theme music. From the U.K., fan Matt Saunders kindly send two .mp3s to share this month - one of the original stirring theme music, and another of the 4th season music which is more up-tempo. When Cameron Mitchell comes out flatly and says he thinks NBC-TV's new cowboy-and-Indian series The High Chaparral will be a good one you'd better listen. The free-swinging, outspoken Cameron can tick off on one hand's fingers the roles he's done that he likes.
" 'Carousel'. 'Carousel' was just dreadful," he told me while practicing chip shots in his Regency hotel suite. " 'Death of a Salesman?' I thought it was a flop on film; such a shame, because it was so good on Broadway. And listen, I made a lot of movies in Europe that were among the worst ever produced anywhere." The stocky, athletic actor still has an unsigned contract from baseball's Detroit Tigers. Mitchell, thus, has extremely high standards for himself. He thought a while and came up with two performances he didn't mind: "Parts of 'Monkey on My Back.' The Barney Rosa picture, were good. And I just finished a low-budget western, 'Ride in the Whirlwind' that I think ought to be up for some awards. It'll be out in the late fall or winter and it's a good one." Anthropologists tell us man is supposed to be complex, not just a simple animal, and Cameron fits into their image. His whole world isn't acting. "I spent some time in a Zen monastery in Japan," he said, "and who knows - if I hadn't become an actor, I might have been a holy man. I come from a long line of Pennsylvania ministers." "But I'm like all humans, I guess - victimized by my own bad habits, like smoking too much. I got used to a good, easy material life and with a family to support, I don't see how I can change. But holy men do inspire me. Gosh, can you imagine a modern, average man spending 40 days and nights in the wilderness?" Candor is Cameron's middle name and has been, most of his life. When he came to New York before World War II from Dallastown, Pa., working as an usher, mail clerk, dishwasher and Radio City sightseeing guide (with another unknown, Gregory Peck), he went to see the Lunts act one night and promptly wrote them a letter criticizing their work. "Their secretary told me to come see her," he smiles, "and boy did she bawl me out. But she let me audition for her and I did a serious scene and reduced her to tears. The next night I auditioned for the Lunts themselves and won a part in their 'The Taming of the Shrew,' which was my big break. Would I write a letter like that now? I doubt it. I'm aware now that it was a damned audacious thing to do." Mitchell is blunt about almost everything. He mentioned some movie directors he thought were simply awful - big-name directors - and he said there were no two ways about it, movies cost too much to make these days. "I feel sorry for most producers, whose hands are tied in so many ways," he said. "They can't do this or that, for fear of offending different blocs and groups." 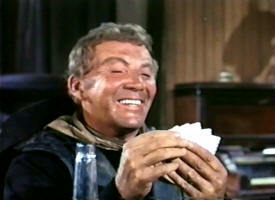 In High Chaparral, he plays Buck - "a lovely, amiable, active bum" - and he says that Mark Slade, who plays his nephew in the series, can't miss stardom. An old Indian aficionado, Mitchell's happy that Chaparral makes Indians out more heroes than villains. "What about that new series on ABC about General Custer?" he demanded, gloweringly. "How can they set that guy up on a pedestal? He was one of the most miserable men of our times, who used to kill women and children - and you know, that was how he lost out, finally, when the Indians baited a trap for him with women and kids." Mr Mitchell swings from the heels. If he says his new show is good, you pay a little attention. He might belt you if you don't.